Description: A brave, powerful warrior from a far away land with an even braver heart. And mohawk. And kilt! Happy Lucky Day! Description: A brave, powerful warrior from a far away land with an even braver heart. And mohawk. And kilt! Happy Lucky Day 2015! Description: A brave, powerful warrior from a far away land with an even braver heart. And mohawk. And kilt! Happy Lucky Day 2014! Description: A brave, powerful warrior from a far away land with an even braver heart. And mohawk. And kilt! Happy Lucky Day 2013! Description: A brave, powerful warrior from a far away land with an even braver heart. And mohawk. And kilt! Happy Lucky Day 2012! Description: A brave, powerful warrior from a far away land with an even braver heart. And mohawk. And kilt! Happy Lucky Day 2011! Description: A brave, powerful warrior from a far away land with an even braver heart. And mohawk. And Kilt! Happy Good Luck Day 2010! Note: Previously called "Moglin Wallace". 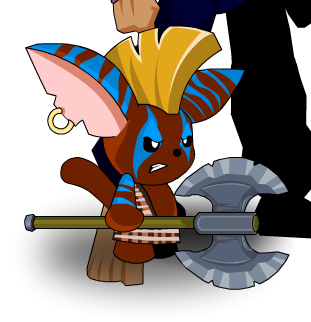 This item is a parody of William Wallace from the film Braveheart. Thanks to OmfgRly and Shal.